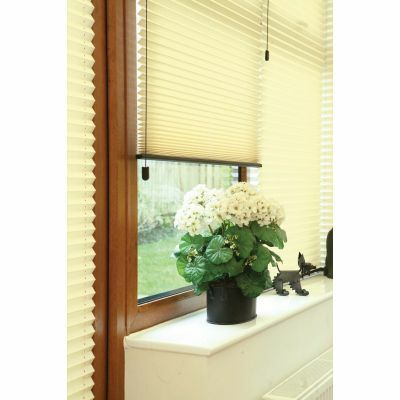 Charisma Blinds Leeds, quality made to measure blinds at great prices. FREE delivery and fitting service. Pleated blinds provide an extremely neat concertina shaped surface that has often gives amazing effects that change as light is reflected by it or passes through it. These blinds have one appearance during the day from the interior, when the sun is being deflected back out. By night, when the light is from within, a whole new effect is realised due to the deflection of the interior light from the "pleats”! A pleated blind may be “free-hanging” or be held in place by cords which are pre-tensioned to allow the blind to be moved up and down and held at any “midway” position. The blinds themselves usually have holes in the centre of each pleat through which the guidance wire passes. Pleateds are “de rigeur” for conservatories. Available in a range of soft finishes to contrast and compliment with most conservatory/domestic furniture the fabrics generally incorporate a light reflective and/or blackout coating for added flexibility. Purpose made mainly for conservatories but are often used for UPVC (and other types) doors due to their “fixed” state. Also can be tailor made to fit recessed loft skylight windows. · Pleated blinds have a versatility similar to roller blinds in that they are up, down or in between. There is little “intermediate” fine control. It is however generally adequate for conservatory use. · These are quite expensive due to high quality materials required to perform well in areas with large extremes of heat and light. · You don’t have to be restricted to “pleateds” for your conservatory. Almost any other type can be fit to your main conservatory windows.